Hey loves! 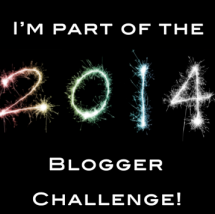 Next year I will be participating in a blogger challenge with some of my blogging friends! I'm really excited to be doing this and think that it's a wonderful idea! The #2014BloggerChallenge was put together by a wonderful blogger Gaby of Another Girly Blog. Gaby thought it would be a great idea to challenge bloggers to write about topics out of their norm twice a month. I think it's a wonderful idea! There are plenty of times where we get writers block and have a hard time coming up with new content. This challenge will help us explore other topics and help keep our blogs active. I think it's also a great way to network and meet other bloggers! If you would like to participate in the challenge all you have to do is email Gaby at: anothergirlyblg@gmail.com. Make sure you send her your name, your blog URL, and your email address! I really hope you decide to join and embark on this journey with us!